WOW Air has – well – wowed US customers, not spoiled by European budget airlines, with rock bottom prices on tickets to Iceland and rest of Europe. Although for now leaving only from Baltimore and Boston, it has already encouraged multitudes of reluctant travelers to visit Iceland. I too was seduced by the prices – even though I don’t have total freedom on choosing when I travel, I was able to get two tickets for half of what the next cheapest option would cost. And that did include all the extra fees I paid. So, is there a catch? 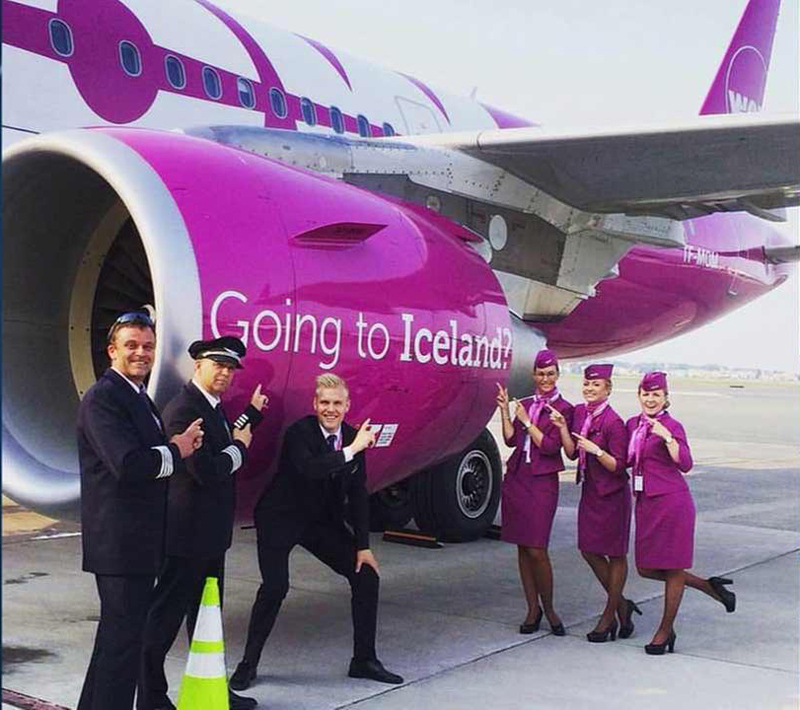 Was traveling WOW Air half as good as Iceland Air? Did I have to pay to use the bathroom? The answer is – no, the price did not reflect the quality. Yes, I would travel WOW Air again. In fact, in some respects I liked it better than a traditional airline. The reason it’s so cheap is a different business model, which includes a complete lack of free service items or food, lack of free on-board entertainment, lack of online check-in, lack of free assigned seats, and more restrictions on luggage. That’s it! A large portion of the ticket price is simply left up to your personal choice. On my flight from Baltimore to Keflavik I had the option of purchasing water, drinks, snacks, meals, and even renting iPads with preloaded movies and games. I did not do any of that because I prepared, but if you really need something – it’s available, and it’s not horribly expensive. The absence of in-flight service means no interruptions, which I really liked. You can get in your seat and go straight to sleep, or start watching a movie, and nobody will bother you with drinks, snacks, trash pickup, or duty free shopping. Finally, the WOW aesthetic is humorous, and the crew is young and friendly, with cool retro uniforms. A real downside of WOW is a limited flight schedule, at least for now. When planning my trip to Amsterdam I decided to go with a more expensive company because I wanted to leave on Saturday instead of Sunday, but WOW did not offer a Saturday flight. The extra day was worth it to me. 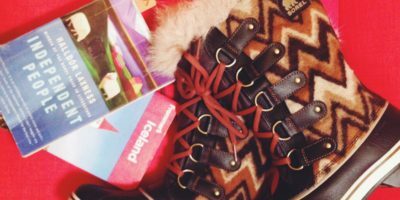 So, how do you prepare for a WOW Air flight to have a wonderful trip without spending a bunch of money on fees and extras? It definitely takes some planning, but it’s not very hard. WOW makes the bulk of its money on luggage fees. Unlike a traditional airline, it does not include free standard carry on suitcases. Each passenger gets one free carry-on item under 22 lbs or 10 kilos, like a laptop bag or a purse. A larger carry-on bag, up to 26 lbs, costs $38.99 per flight leg. However, a checked suitcase up to 44 lbs costs $48.99 per flight leg. So your carry-on weight is $1.50 per pound while your checked weight is $1.11 per pound. Do you see where I’m going with this? Check everything you can and bring only the essentials on board with you for free – your laptop, phone, medications, and your food. If you are traveling with another person, as I was, share a single large suitcase and bring two small personal bags on board. Another surcharge is paying for your luggage when you check in. It is up to 37% more expensive to pay your luggage fees at the airport! So plan how you are going to pack and pay when you buy your tickets. Finally, double check the weight limits for your bags on your reservation and weigh your bags before leaving home. We failed to do this, so both of our personal bags were over weight (also, I think the limits were lower at the time). However, the check-in staff did not charge us any extra fees – they simply advised us to keep the weight down for the return flight. Since then, we have invested in a luggage scale. You can get a small and sufficiently accurate one for under $10 – and you should bring it with you on your trip. If you are traveling by yourself, you don’t need to pay for seat assignment. Just get to check-in on time and get a seat for free. If you are traveling with someone else and want to sit together, or you really like having an aisle seat, you can pay for an assigned seat. But it doesn’t have to be expensive. Some seats are better and cost more, while a regular seat is only about 12 dollars. I chose to pay for seats because it was worth it to me to sit together with my husband. Normally, I hate printing. I am all about electronic boarding passes and saving trees. But the cheapness of WOW made me suspicious, so I decided to cover my bases and printed my reservation. I was right! When we got to the check in counter in Baltimore, someone had already been assigned the seats I paid for, and nobody had any record of my seat reservation. I quickly produced my confirmation email with seat information, and the other passengers were bumped to different seats. I am very against buying bottled water in developed countries. America has safe tap water, and Iceland has great tap water. Bring an empty 1 liter reusable water bottle per person and fill it at a water fountain at the airport after you go through security. It will be plenty to get you through the flight, and you can refill it again at a water fountain in Keflavik. Right before boarding in Baltimore, there was a mad dash by WOW passengers to the water fountains to fill Nalgenes. That’s the way to go – you will save money and protect the planet from unnecessary garbage and pollution. I’ve been flying with my own food for a long time largely because I prefer my food over airport and plane food. First class meals aside, most plane food is sub par, and on WOW you will have to pay for it. Now our go to food for transatlantic flights is vegan sandwiches (PB&J, Field Roast & Daiya), a package of Fig Newmans, and some fresh fruits and veggies for snacks, such as apples, oranges, carrots and cucumbers. I always bring a bag of Gin Gins, the ginger candy, because I tend to get nauseated on planes during descent or turbulence. To enjoy free movies on board, I download several beforehand to my laptop and bring my own headphones. If you are traveling with another person, you can grab a headphone splitter and enjoy a movie together. I’ve used both of these and definitely prefer the flexible one. It’s less pretty but more practical in a confined space. Another option is podcasts on your phone and, of course, good old books.